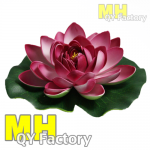 LED Lotus Flower | SkyLanterns, Hanging Lanterns, CandleBags. Life-like Lotus Flower with 8 LED’s hidden below the leaves. These beautiful flowers can set the mood inside and outside the home. Water-proof electronics means it can be used in pools and yards without fear of rain or wet grass. They can be used virtually anywhere. Ideal for setting the ambiance at events and weddings as well. Nice subtle lighting for walkways, Gardens, Pools, Pool sides, Decks, Dens, Sunrooms, Living rooms, Bedrooms etc. Also if entertaining, Wedding halls, Restaurants, Lodges and Bars. Take to Camp or the cottage. A new unique item that doesn’t require electricity to shine. Can be put nearly anywhere. Uses CR2032 coin batteries (included). Switched on and off from under the flower. Simply turn the housing clockwise to turn on, counter clockwise to shut off. Fully assembled and simple to operate. They are new, unique and trend-setting. Battery power increases their usability. Nothing of this quality and appearance on the market.